Bryant Park Blog: Are You Mad for March Madness? Are You Mad for March Madness? It’s March which can only mean one thing… MARCH MADNESS! 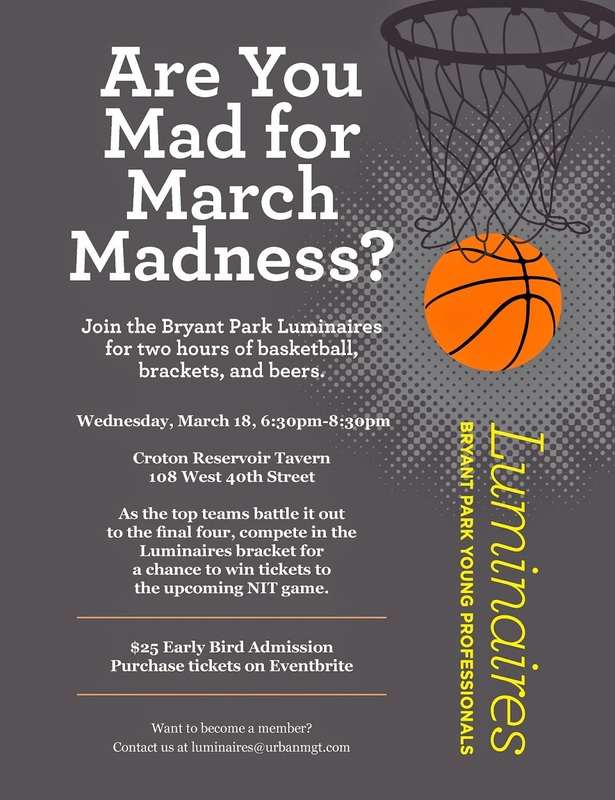 Join the Bryant Park Luminaires for the first round of the NCAA Tournament at Croton Reservoir Tavern and enjoy 2 hours of beers, bites and basketball. You are not going to want to miss this intense action and the chance to win 2 tickets to the upcoming NIT game. What comes with admission? Drink up with 2 hours of beer, wine, and bites. Where can I join in on the fun? Croton Reservoir Tavern, 108 West 40th Street. When does the Madness begin? Wednesday March 18th from 6:30pm-8:30pm. Why? Who doesn't like meeting new people while watching your favorite college teams battle to the final four. How can I gain access to the event? Simply register with the link below. Who are the Bryant Park Luminaires ? We are a membership based organization for young professionals, 21-35, who work or live near Bryant Park, or to whom the park is important in other ways. The Luminaires represent the best of New York and are entitled to privileges at park related events and special networking opportunities in affiliation with their connection to Bryant Park. The mission of the Luminaires is to build opportunities for young professionals to meet, make new personal and lasting professional connections, and utilize the Park as a central and important location for midtown’s young professionals. Interested in becoming a Luminaire? Email luminaires@urbanmgt.com for more information!